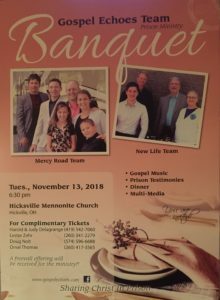 The Gospel Echoes Annual Banquet will be held at Hicksville Menn. Church, Hicksville, OH, 237 West Arthur St, Hicksville, OH 433526, Tuesday, November 13, 2018, 6:30 PM. The evening will include a Home Style Dinner, Gospel Music, and special testimony presentation of Ex-Inmate Larry Blue. Transformed by the power of God from addictions to serving as Prison Chaplain, Drug Counselor and currently serving as Recovery House Inspector for the State of Indiana’s over 90 Recovery Centers. call for complimentary tickets, Harold & Judy Delagrange 419-542-7060, Lester Zehr 260-341-2279, Doug Nolt 574-596-6688, Orval Thomas 260-417-3565. A Freewill offering will be received for the ministry.